Coffey Construction UK has been awarded a new contract for the Refurbishment to the B listed, B971 Dee Bridge at Ballater, Aberdeenshire for Aberdeenshire Council. The project will commence in July 2018 with Completion programmed to take place in November 2018. The bridge is a B listed structure, on the B971 near Ballater and was built in 1885. 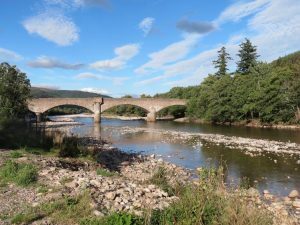 The bridge is a four-span (length 108m), granite masonry structure spanning the River Dee to the South East of Ballater. The bridge, by Jenkins and Marr, has four arches faced in granite. It was opened in 1885 by Queen Victoria. While the arches are all the same width, the two side arches appear to be shallower, allowing for a slightly humped profile to the roadway. This is reflected in the parapets, although they are stepped rather than curved as is more normal. The centre pier is flanked by semi-circular pilasters rising up to support square refuges which are corbelled out. These are not repeated over the other two piers, which again is unusual. Provision of an access scaffold, which must be erected in such a way as to prevent any debris from entering the watercourse. Application of a bitumen bead seal to the interface between carriageway surfacing and bridge parapet. Removal of redundant Air Valve in the carriageway and associated carriageway patching. Sealing of joints in the carriageway surfacing from historic excavation tracks. We are pleased to be engaged in this upgrade of this listed structure and to be working with Aberdeenshire Council.